HomeMotorhomeTwo M’s – Meat and Malaga! Two M’s – Meat and Malaga! As we leave the delightful countryside and head to the metropolis that is Malaga. Sat 5/2/16: Arrived at a lovely pay for aire about 17k’s outside Malaga but still on the coast and the plan was to cook in and have chorizo and rice, which was for us completely frugal as the chorizo was a second meal as well- having brought it for our picnic and saved some purposely to cook and have a dinner with. Excellent –until we arrived at the aire and when checking in the owner said they were having a BBQ that afternoon, as much meat as you wanted, salads and drink. The choice for David was not difficult, meat and a BBQ to boot as well. So the chorizo and rice was abandoned to the next day and off we trotted to meet our fellow motorhomers and have meat and more meat. A lovely choice of wonderfully cooked meat was had and I think we did it justice! But we had the advantage of lunchtime eating and so could actually have a walk after and let the food digest. 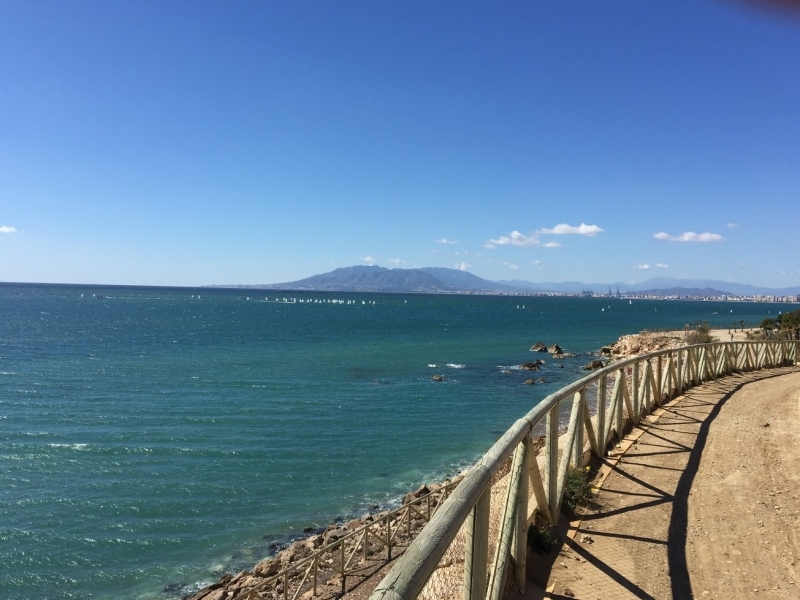 Sun 6/2/16: A day we wished we had done something else, anything else in fact other than do the cycle ride into Malaga and go to the Picasso Museum. We headed off and had a lovely ride along the beach all the way. As it as a Sunday the route was busy with other cyclists, walkers and families- dogs, children and all. In fact at one point the path was so narrow and busy that I thought I’ll end up with a plate of sardines in my lap, which would have been lovely as they looked wonderful all cooked on huge charcoal fires along the way. 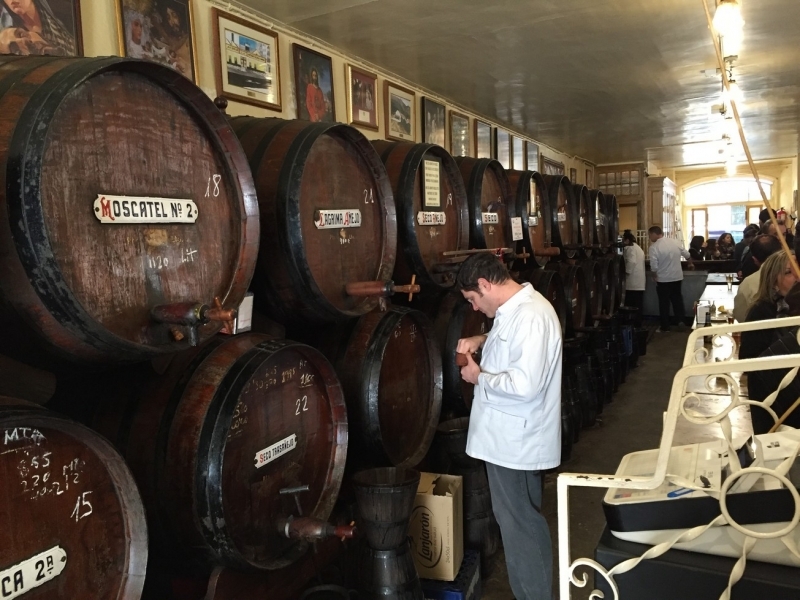 We chained our bikes up outside the office de tourism and went into a delightful old bar, with just barrels of fino’s and vermouth as it’s called here and in fact I tried one of the latter and it was really quite nice- I’m not usually a vermouth drinker but this one worked for sure. Before we went into the Museum we had a couple of tapas so as not to be starving for the job in hand of studying the life and works of Picasso. Here we had the most wonderful rabo de torro- 2 small pieces on the bone with some boiled potato and for me I think it was the best oxtail we had thus far. The Picasso Museum is definitely worth a visit but for us it came at a high price as when we returned to the bikes mine had been stolen- chain cut through and gone. I hope that the low life thieves who stole it are under a bus by now and also the people who buy it as well, knowing perfectly well that it was stolen. Any way end of rant and despite not being hungry when we got back we did in fact have the chorizo and rice- another one pot wonder on my part and very Spanish as well. Mon 7/3/16: A very grey day in Malaga as the weather had turned from the day before and the sky was grey and full of rain, which suited our mood as we headed back to the police in Malaga to file a full report of the theft and also to try and look for options for a replacement. We actually as the day wore on quite fancied a burger and there are several chains here similar to our own Gourmet Burger company or Byrons, but as ever we seemed to be out of sync time wise with them and despite Malaga being a huge city and they were shut. Not really wanting to explore anymore we decided to have food in the same tapa bar as the day before- as it was a lovely bar and they had been very friendly with us on the Sunday. We asked them for recommendations and he opted for the cold potato salad served with mayo and orange- it was absolutely lovely and a new tapa for us. We had the anchovies in vinaigrette which I just love and think are the best way to have them now, plus a hot tapa of chicken meatballs. All absolutely divine and very tasty. will get that call to say my bike has been recovered!. We cycled back the 17k’s in sunshine again today and ate in a lovely sea front restaurant just by our campsite. It was fairly late afternoon by then so we were both quite hungry. They had migas on the menu which we have had before and David is quite taken by this poor man’s meal of fried breadcrumbs, this however came with a fried egg on top. I persuaded David to chop and mix the egg into the breadcrumbs so as to spread the eggy flavour, which he did and loved the dish, but for a starter it is quite filling. I opted for a salad and some prawns of which I wasn’t quite sure whether they were going to be served hot or cold- the prawns not the salad! They came cold and were lovely with the salad, which are generally thus far here, just lettuce, onion, tomato, sweetcorn and tuna but dressed with some white vinegar and olive oil work very well especially for a non-lettuce lover like me. Thurs 10/3/16: Off for a game of golf at lunchtime and of course before we played our round a visit to the 19th hole was required and again a wonderful tapa- this time my beloved anchovies served upon small rounds of bread and also chicken meatballs- which set us off quite nicely for the game. Actually I was just walking the course while David played and was helping out with advice on his swing, putting etc. Didn’t work too well as his score was terrible, but never mind was a bit of practice at least. For our dinner we headed into the main town and after considering our options we chose a small local bar which had menu del dia outside and that’s exactly what we thought we were getting when the waiter reeled off the main course option and presented us with a plate of asparagus tortilla and tomato no option to start and then for the pudding the usual range of fruit, flan and arroz de leche. All very edible and good enough for a menu del dia, however the bill never reflected that and we had been charged for everything including David’s pudding of 2 mandarins at €2.50. For that price you can buy several kilos. So a mistake again made by us, we should and will now ask if the menu is completa and what price, if we are not given an actual menu. It was a rather solemn walk back to NikI as the dinner had probably been one of our more expensive ones in Spain and certainly not worth it. Fri 11/3/16: Another beautiful day and after an early walk along the beach we headed into the Sierra Nevada and after a nerve racking lost moment in the small narrow backstreets for a mountain village we made it to our mountain camp and we were both absolutely blown away with the camp, location mountains etc. Despite arriving in the afternoon we still managed a quick walk around and into the nearby village of Guejar Sierra. As we walked along the small mountain path we stumbled upon a small bar in amongst the fields and farms and so in we headed and boy this place was a hunter’s paradise. The small bar was covered with heads of many a dead animal and also a good few plaques with teeth and bones on them, plus on the TV was the hunting channel as well of which the barman delighted in telling us it was of a local hunt. We made into the town which is an absolute delight of small narrow hilly streets full with little bars and restaurants. We had an amazing tuna, potato and egg tapa which really was about starter size before heading home to make one of our all-time favourites of keema peas. Except we couldn’t find any peas even though they are coming into season here and so we had aubergine instead and I even made a raita to go with it. No the bike never turned up but tapas do make a difference. Here they are huge and very addictive.